I was so excited after I made this that I couldn't wait to post it, so it is skipping past my growing backlog of baking posts, expressed delived to you. If you've been reading my blog in the past, you will have heard about my obsession with homemade kaya. 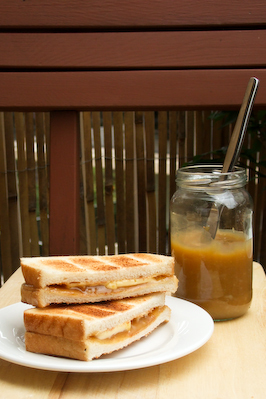 It is a thick, sweet coconut curd/jam, made with eggs, coconut and flavoured with pandan. In Malaysia, it is served on toasted white bread with a thick layer of butter, or on top of coconut glutinous rice, or even inside a pastry puff. A perfect kaya (for me), has to be super smooth, not even the tiniest hint of roughness, and caramelised so that it is golden brown. The stuff they sell in the Chinese supermarket just doesn't cut it, it's usually very grainy in texture and a green colour from the pandan essence that they use. The homemade stuff is usually cooked with fresh pandan leaves, so it doesn't turn green. The homemade stuff is also usually made with freshly squeezed thick coconut milk, which means you need to get a fresh coconut and grate the sh*t out of it. Even with one of the nifty coconut graters that they usually use, this is a lot of work just for a jar of jam and it has been the main thing stopping me from trying this recipe at home. 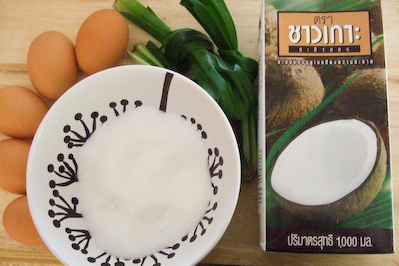 But after finding some fresh pandan leaves at the Thai supermarket Pontip (a couple doors down from Chat Thai), I decided to give it a try with some tetra-pack thick coconut milk from Thailand, just to see if it came close to that lovely golden spread that I miss so much. A phone call to my Mum reveals that she pretty much knows a recipe off the top of her head, so after getting some valuable advice from her, and finding a pretty decent looking recipe by Amy Beh, I tried to make my first batch of kaya. I was very worried about it getting lumpy or grainy, so I cooked it over a double boiler at a very low heat, stirring constantly. A lot of recipes tell you to leave it to steam with a cover over it for a while, letting it caramelise, but I was too scared to try this method. The result was a very, VERY smooth spread, sweet & brown from the long cooking time, heady with the scent of pandan leaves and richly flavoured with coconut and egg. It wasn't quite as caramelised as I would have liked, so I added the extra caramelised sugar to give it that really golden tint. 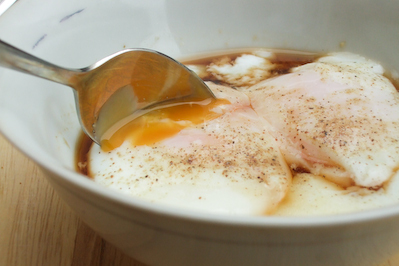 Served thickly spread on toast with loads of butter, and a side a soft boiled eggs with a splash of soy sauce and white pepper, this is my most favourite breakfast in the whole wide world. Set up a double boiler on your stove top (I used a wok full of water with a wire stand for my mixing bowl to sit on). 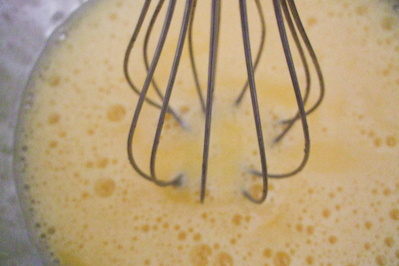 Whisk eggs and egg yolks in a heatproof mixing bowl until it is well combined. Gradually add sugar while whisking, and beat until the sugar starts to dissolve. Slowly add thick coconut milk to mixture, whisking until all the sugar dissolves. 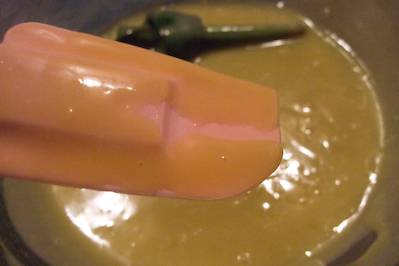 Strain mixture if using fresh or canned coconut milk. Place heatproof mixing bowl in double boiler, on a low enough heat so that the water is gently boiling. 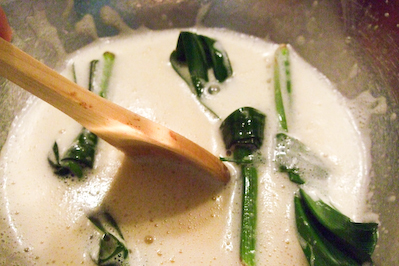 Add pandan leaves and stir continuously. You can use a wooden spoon to stir but I prefer to use a silicon spatula, since it helps to stop a layer from forming and getting lumpy on the bottom. Stir continuously for 50-60 minutes. The mixture should start to go brown and thick around the 45 minute mark. If you think the mixture is cooking to fast and lumps are appearing, remove the bowl from the double boiler immediately, whisk to remove any lumps and reduce the heat before you return the bowl to the double boiler. I found that the egg white would sometimes clump together around the pandan leaves, and I had to scoop several small solid lumps of egg out of the mixture while I was stirring. 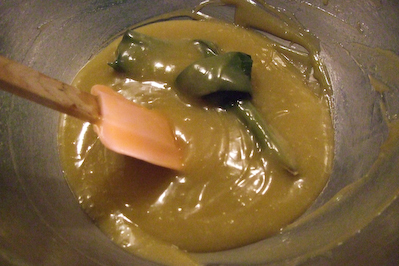 The mixture will start to get very thick and sticky. When it is at this point, remove the pandan leaves before it gets too difficult to lift them out without taking half the kaya with it. If the mixture is starting to get too thick and it hasn't gotten brown enough, add a tablespoon of water to the kaya. It may be tempting to remove the mixture from the heat as soon as it turns brown, but you don't want to be very milky and creamy, so keep stirring it over the heat until it is light brown and not too milky. At this point if you want to be a deeper gold colour (trust me it makes it so much better), fry 2 tbsp of sugar in a small saucepan until it melts and goes golden, then add a tbsp of water and stir until the caramelised sugar is completely dissolved in the water. Carefully and slowly add sugar water to the kaya, a bit at a time, until you are happy with the sweetness and the caramelisation. 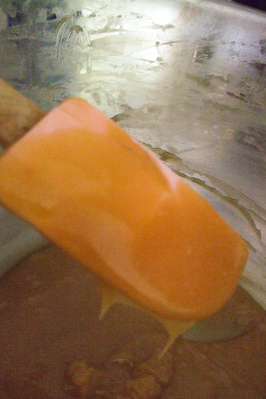 The mixture should be a smooth, lava-like texture and a dark golden colour. The double boiler ensures that the mixture does not go grainy or lumpy. Cool the kaya completely before placing in dry, clean jars. Store in fridge. I know, the yield is piddly compared to the amount of effort you put in. But it's so worth it. 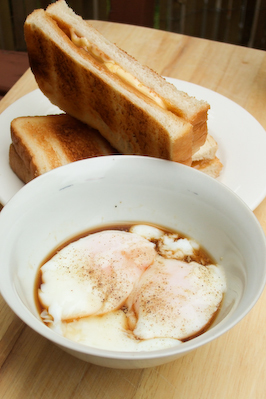 My arms are still aching from the hours of continuous stirring I did, but the kaya was so good fresh off the stove with toast and soft boiled eggs. Boil water in a kettle or on the stove. Place eggs in a metal pot that comes with a lid. If you are worried about your eggs cracking, use a pin to carefully poke a hole in the base of the eggs and this is a foolproof way to stop your eggs cracking on contact with the hot water. 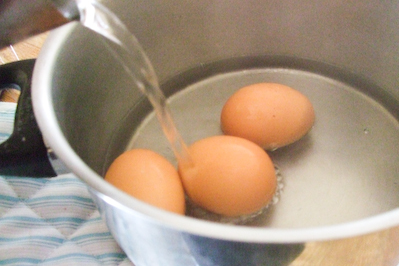 When the water is boiled, pour over the eggs, make sure that your pot is the right size that the water level will cover the eggs. Place lid on and leave it for about 8 minutes. 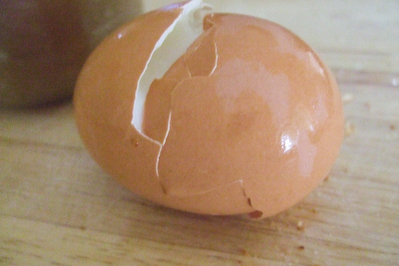 Remove eggs using a slotted spoon and carefully crack along the middle of the egg using a knife. Crack open egg very gently into a small bowl, the egg white should be just set but still runny and should stick to the egg yolk. If there is still uncooked egg white then you will have to adjust the amount of time you keep the lid on the pot. Add a splash of soy sauce and a shake of white pepper. 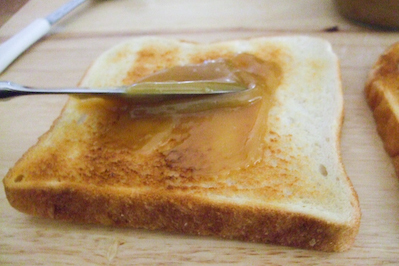 On the other piece of toast, spread a thick layer of kaya over one side. 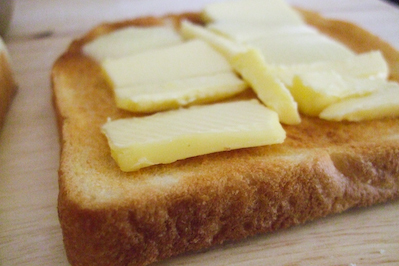 Sandwich the two pieces of toast together and then slice in half using a bread knife. 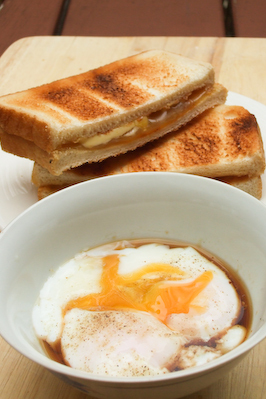 Serve toast with soft boiled eggs. This breakfast made me a very happy girl. I still want to perfect the kaya recipe, but this one is pretty decent, it tastes really good but it's just a tad milkier than I would prefer. It's probably because I used not-fresh coconut milk, but I don't think I can be bothered grating coconuts anytime soon. The stirring is pretty tiring, but the final result is worth the effort. There are definitely easier recipes out there, ones that don't require constant stirring, and others that don't use a double boiler, but I think this method gives you the smoothest kaya, and the texture is one of the most important things. If you can't get fresh pandan leaves a bit of pandan essence will do, but it might turn your kaya a bit green. Yum yum this looks so good! 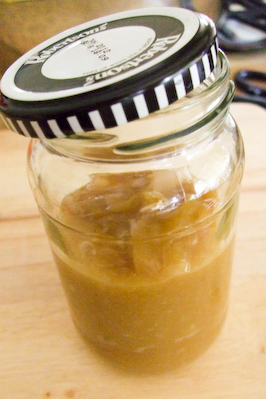 I've been steadily devouring a jar of the bought stuff but i imagine that homemade would be so much tastier! Oh, you did good! I'm all for bought coconut milk, but your effort has made me want to go to Thainatown to check out the fresh coconuts and pandan leaves. You finally made the kaya!! They are so smooth and with the right color. I must try out this Amy Beh's recipe. Nice work with making your own kaya. Looks like it was well worth the effort. I love Kaya but I have never thought of making it myself. Holy Guacomole Batman that is a lot of butter on that toast. Woah. Ive heard so much about kaya. Im desperate to try it! It probably wouldn't even come close to its deliciousness but if your in a rush in the morning and need a sweet fix toast turkish bread, then slather it with butter and sprinkle it liberally with icing sugar. DIVINE!!! Steph! I knew this day would come! Congrats on making your own kaya! It looks terribly delicious!! I need to try some of that Kaya! Good god I can taste the butter from here! I bet this would be heavenly spread between two cookies, too. Thanks for teaching me about a new spread I'd never heard of before. Ooo! 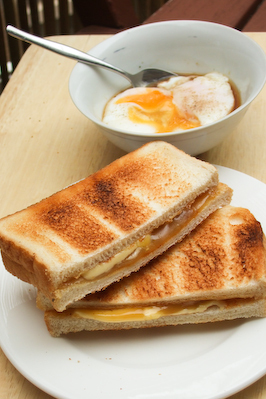 I just went to Malaysia for the first time a few months ago and I've been craaaaving some kaya toast and soft-boiled eggs ever since I got back! Thanks for posting this recipe and such detailed instructions. i live in Germany and there is no pandan leaves, what can be the replacement? Nina. Hi Nina - You can probably try substituting it for pure vanilla, e.g. 1 vanilla pod split & scraped into the mixture and then throw the pod in as well, but it won't have the same heady scent as pandan. Hope that helps! I think I just died and went to food heaven!!!!!!!!!!!!!!!!!!! My arteries are tightening by just looking at those wedges of butter. Good lord! I have to try this, it sounds delicious. also what does pandan leaves taste like? I used coconut cream, Chaokoh brand from Thailand, which comes in a tetra pak and is smoother than the canned coconut creams. I'm sure canned will still be fine though. It's hard for me to describe how pandan leaves taste, it's a very unique flavour. If you smell the leaves you will get an idea of the flavour, since it is so fragrant. It's sort of a sweet, almost coconutty flavour. Hope that helps! Helen - Hehe the jar stuff is an adequate substitute but I love the smooth texture of the homemade stuff! It's second to none! Deadmoan - :D Glad you liked it! Belle - Ahaha Thainatown! I hadn't heard that before. I couldn't bring myself to do the fresh coconuts but the pandan was so worth it! Ellie - Yay! :) Yes but it was so tiring stirring it for so long! It was a pretty good recipe, sooooo smooth, I wish I had fresh coconut cream though! Karen - I hope that your tub lasts until I next see you! I ran out of jars and had to put yours in a container. A cupcake or two - Ooh you should try it! It's not right until you have tons of butter, trust me! Kate - You should try it! 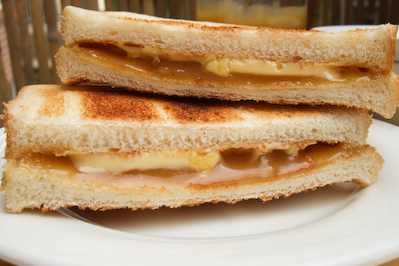 It's the best thing to have on toast. Ooh that sounds pretty good, thanks for the tip! VoN - Aww thanks! :) Yay try making it! Betty - Heehee!! Thank you! I will bring some for you to try! Carolyn Jung - Ooh I've never thought about putting it on cookies, but they do put it in pastry so I'm sure it would work! ivorypomegranate - Haha awesome! Isn't it the best? I miss it so much, I just had to do it. You're welcome! Hannah - Ooh tabasco, there's one I hadn't thought of! I love my chilli too. John - Ahh yes, but it's the only way to serve it! I was drooling over the description of kaya from Lori at Fake Food Free, who picked some up during her SE Asia vacation last fall. As soon as I saw Karen at Citrus & Candy's tweet about this, I had to come over! This looks so scrumptious - all that stirring certainly paid off. I'm excited because I can find that same 3-pack of Chaokoh coconut cream here. I'll have to give this a go! Somebody just send me your link via Twitter. I traveled around SE Asia last October and this was one of our favorite finds. I just posted about this week. So happy to have this recipe! I can't wait to try making it myself. Tangled Noodle - Oh fantastic! Thanks for passing on the link :) That is the best coconut cream I've found for this recipe so far, good luck! Lori - Whee I'm always happy to find another kaya lover! Hope it turns out well for you! i'm interested to make my own kaya as wedding favors :) but i'd like to know, using this recipe, how long is the shelf life? 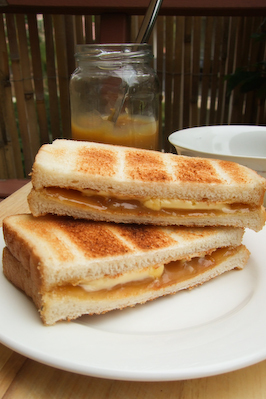 Thanks for posting the recipe for Kaya. 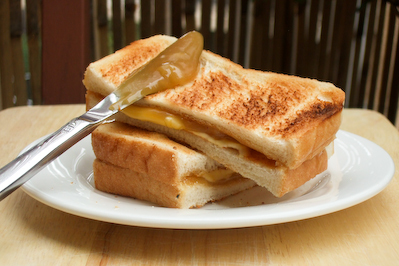 I had some at Coconut House in Melbourne and couldn't get over how amazing it tasted with hot buttered toast. I made it yesterday and yes - your arm does get sore from all the stirring. The difference in my case was that it only started to get thicker and sticky at the 70 minute mark. But the result was well worth it. Now I have orders to take it in for brekkie for my mates! Nadia Habib - Thank you so much for the feedback! Haha hope your arm has recovered, lucky for you it didn't take as long as mine! I was probably too scared to turn up the heat which is why mine took forever. Glad everyone enjoyed it! linda - :) You're very welcome, I'm so glad you like kaya!!! Used to spend >3 hours doing this on the old recipe. Never again!!! Thanks for this great recipe. Yummy, just finished making some though instead of just coconut milk I used a blender to combine some pandan leaves with the milk to make it more pandan-ish (don't think that's a word) as I love pandan. As I thought it turned out VERY green! !